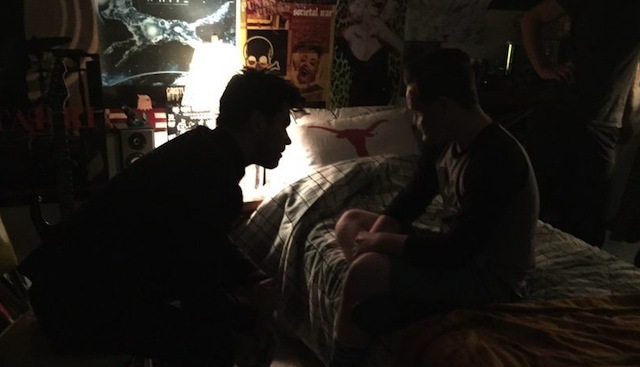 Seth Rogen Teases the First Image of Dominic Cooper’s Preacher! Seth Rogen has just revealed, via Twitter, our very first look at Dominic Cooper as Reverend Jesse Custer from the upcoming “Preacher” series headed to AMC! Below, you can check out the full version of the shot, which also offers a glimpse at Ian Colletti’s Arseface (and his noticeably more contemporary bedroom). That also appears to be the pilot’s co-writer and director, Evan Goldberg, in the background. Cooper leads the cast that also includes Joseph Gilgun as the vampire Cassidy, Ruth Negga as his gun-toting ex-girlfriend Tulip, Colletti as the kindhearted yet startling Arseface, W. Earl Brown as his father Sheriff Hugo Root, Lucy Griffiths as Emily Woodrow, an original character in the series and love interest of Jesse’s, and Elizabeth Perkins as Vyla Quinncannon, the owner of the local slaughterhouse and a semi-original character.